Here is a Whink Cooktop Cleaner review from a reader, Sandee. Hi Taylor: I just had great success removing a stain and thought about you right away! I had a pot of pasta cooking on my glasstop stove and it boiled over while I was not watching. The pasta water created nasty, cooked on stains on my cooktop. I waited for it to cool and then used my new bottle of cooktop cleaner that I just bought, and it worked really well. It is Whink Glass/Ceramic Cooktop Cleaner. Thought you might be able to use this info if you didn't already know about it. I've used Whink brand on laundry and it is great too. Thanks Sandee for this helpful tip. It sounds like a great product. The not so great thing about cooking is cleaning up the dried on, set in stains that can develop on your cooktop from a combination of oil and grease, spills, and heat. Does anyone else have a favorite cleaner for cleaning their stove or cook top? If so, you can share your cooktop cleaner review here, or read other reviews of other products that have already been submitted. In addition, Whink makes a large line of specialty cleaning products. I would love to hear even more reviews of these products from people who have used them. You can share your reviews of these products here. By the way, Sandee has a great website of her own that you should check out, at Theme-Party-Queen.com. Join in and write your own page! It's easy to do. How? 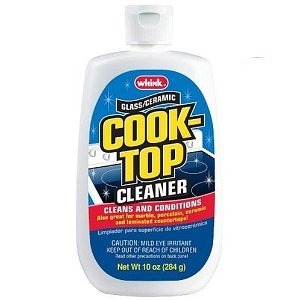 Simply click here to return to cooktop cleaner.